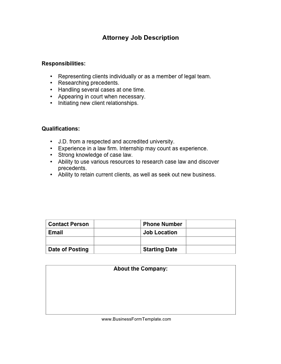 Law firms can use this attorney job description to clarify qualifications and responsibilities with new lawyers. Representing clients individually or as a member of legal team. Handling several cases at one time. Appearing in court when necessary. J.D. from a respected and accredited university. Experience in a law firm. Internship may count as experience. Strong knowledge of case law. Ability to use various resources to research case law and discover precedents. Ability to retain current clients, as well as seek out new business.